Hello Kitty is probably the only cat in the world that has no mouth, but still can get everyone excited and going gaga over. It is baffling as much as it is miraculous, but there is no denying – Hello Kitty is a trend that will never die. So, taking the fad to a whole new level is opening up themed cafes and paying homage to the cat. Well, Hello Kitty lovers sure aren’t going to complain about it being gimmicky, simply because it is Hello Kitty. 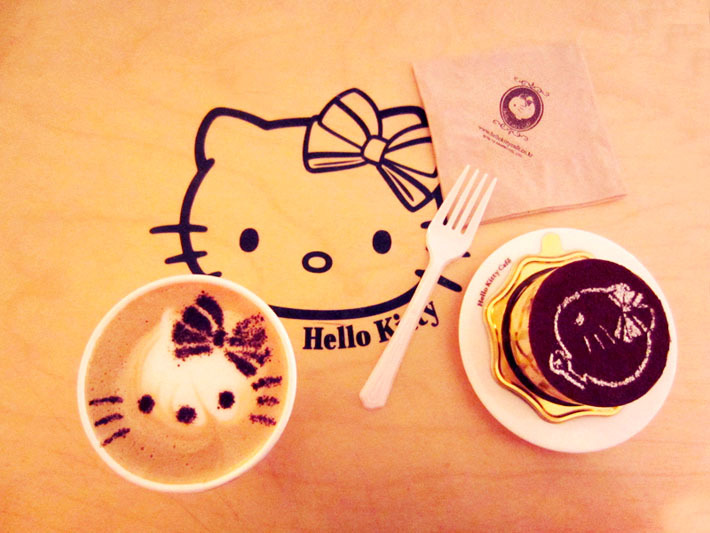 Have you been to any Hello Kitty cafes? There are five in Asia – Seoul, Taipei, Hong Kong, Bangkok and Singapore. And yes, they are all pinky and cutesy, and very very dreamland-like. Heck, even non-Hello Kitty fans will have a ball of time in there! 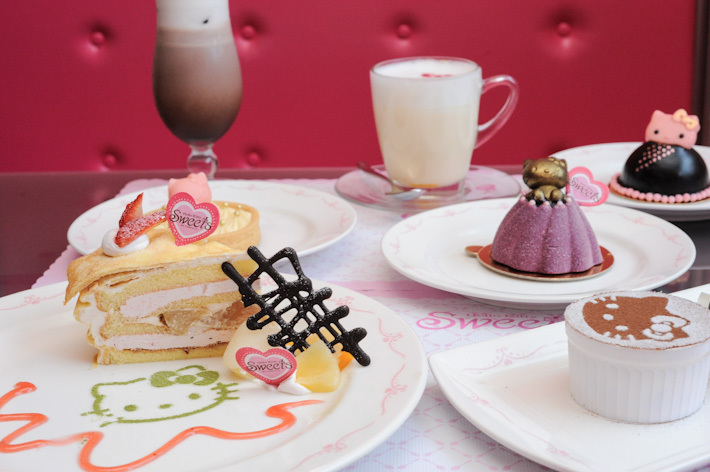 Here are the five Hello Kitty cafes in Asia. Go ahead, have a pretty cake in there and call yourself a fan. We won’t judge. Get ready to be blown away by the dramatic décors of this amazing Hello Kitty Cafe. Everywhere you look, there would be a Kitty staring right in your face – the food you eat, the latte you drink, the sofa seat you sit on, the wallpapers you gaze at, the tables where your mobile phone rests on and even the toilets, are not spared from Hello Kitty. Located in Hongdae (Hongik University) district, Hello Kitty Café is extremely popular with students of Hongik University. The food and drinks are immensely sweet and will certainly curb your cravings for desserts. To sum up this place in two words: Sugar rush. Don’t you want to teleport yourself there already and relieve those childhood memories? With its signature pink decor, the cosy little cafe can be spotted from afar. The cafe is lined with pink and white furniture, the scent of the sweet desserts filled the air, soft piano pieces looping in the background, and all the waitresses are exceptionally cutesy with their frilly French-maid inspired uniforms. The desserts are priced between NT$300-360 (S$12.50-15), and each set comes with a drink. And with every order, you get a complimentary custard pudding – in the shape of Hello Kitty’s head, of course! An obscure hood that is mainly residential, Tai Hang sits southeast of Causeway Bay and is fast becoming a dining destination. In the recent years, the gritty neighbourhood sees many new cafes and dessert shops, and the whole Tai Hang area henceforth exudes a charm that is second to none. The latest addition to Tai Hang is Hello Kitty Secret Garden. Other than the signature Secret Garden Burger, the cafe has desserts – such as Chocolate Tart, Banana Chocolate Ball, Blueberry Mousse Cake, and Apple Pie – available on the all-day menu. This is the newest of all three. It’s huge, and it’s cute; you should go some time soon. Sitting within Siam Square One, Hello Kitty House Bangkok is a multi-story unit that not only comes with a Hello Kitty Cafe, but you can also find a Hello Kitty Shop and Spa. Pink and prominently, you will definitely not miss it from the main road. Step in to a wondrous Sanrio world, and be wowed by the expansive Hello Kitty decor. On the first level, the Hello Kitty Cafe comprises a take-away counter for drinks and snacks, and a dine-in area with a massive display of thematic sweets. The second level is also part of the cafe, with a huge space for seating and big pink chairs to complete. 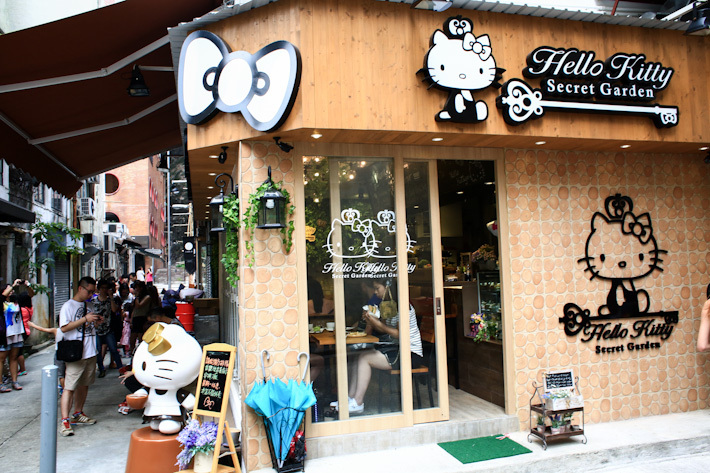 Over at the basement, there is Hello Kitty Shop – a merchandise corner for you to pick up little Kitty-chan souvenirs. Think umbrellas in candy colours, utensils and lunch boxes, printed tees and cosmetics, and even badminton rackets and basketballs! There is a Hello Kitty Spa too! Go on, treat yourself to a manicure and have your nails painted with flowers before leaving! Alas, we finally have a Hello Kitty Café on our very own soils! The café in Changi Airport just opened this year in May, and has already seen many crazy Kitty-lovers and non-fans alike giving the food and ambience a go. The café space is inspired by its surroundings – Changi Airport Terminal 3′s Orchid Garden. Inside, you’ll find rustic, nature-inspired hanging chairs and leafy décor. There’s not so much pink here, but the space manages to pull off a more relaxing, chilled vibe. Items from the menu here can start from about S$17.90 for something like the Enchanted Forest Quesadillas, and can perhaps go up to about S$24 for the Cowabunga! Wagyu! meal. The menu items are inspired by local flavors, such as the aforementioned wagyu cuts, which are drenched in aromatic Rendang gravy. The store also has its own retail section, carrying Singapore-exclusive Hello Kitty merchandises like special blend teas, postcards and of course, plush toys! The café is open for 24 hours everyday, so you can even pop by in the wee hours of the morning for a dose of Hello Kitty!